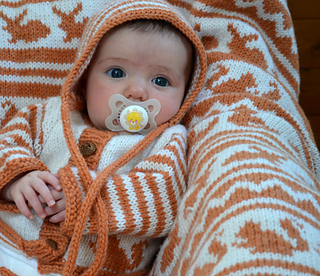 Description: This two-color DK-weight baby sweater is sized for 3 mo. infant only (no alternate sizes provided). 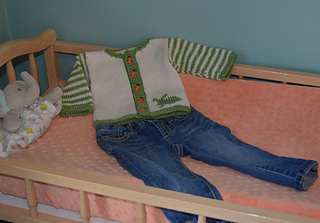 Sweater is created in one piece by working back and forth on circular needle starting at lower edge. Shoulders are grafted. Sleeves are added by picking up armhole stitches and knitting in the round on double-pointed needles. Provisional cast-on is used so that stitches can be reused later for a tidy bottom edge. Alternate instructions are provided for those who prefer not to use a provisional cast-on. Motif is added using duplicate stitch when knitting is complete. Charts for three different motif options are included: squirrel, bunny, and chick. Pattern is written for Intermediate level knitters who understand basic knitting pattern abbreviations and knitting techniques such as knit, purl, increase, decrease, bind off, Stockinette stitch, Garter stitch, Duplicate stitch, and Kitchener stitch.